The man is a microcosmos. All cosmic laws are summarized in the human being. The universe is a hologram, its every part contains and reflects a unity. But that it acts as a matter only in the presence of a conscious observer. Therefore, when the observer is not conscious, the physical world disappears, as it happens in a deep sleep without dreams. The absolute is everything that exists. Nothing is possible outside of it. The absolute is the Divine whole. The soul of man is an aware subject of the objective existence. The human soul is the individual emanation of the Divine whole. So, the soul is not some kind of psycho-energetic creation that is created and disappears with the body. The soul is an individualized divine consciousness, part of the same divine consciousness that enables the entire cosmos and life. Because of the very presence of the man’s soul, nature is shaped as it is, in all life and existence. The soul as a magnet, by its very existence, attracts the entire shaping of the energy of nature. In its higher dimensions, before the incarnation into the body, the soul is aware of itself and its divine essence. The purpose of the man’s existence is to wake up, during his life in the body, and become conscious of his soul, which is the emanation of the divine whole. Then the divine whole becomes complete in the man, it is manifests through him. Then God becomes man and the man realizes God in this world, which thus becomes filled with divine presence. “This place is a dream. Only a sleeper considers it real. The simplest view of the organization of our being, which everyone in their own experience can recognize, is the division onto the lower and higher mind, and the consciousness of the soul. The higher mind (2) has a higher and broader perspective, it sees every event from a larger dimension, in a wider context, and therefore can provide information to a lower, physical mind or Ego (3) which has a very limited perspective, and sees only what is perceived by senses. This information from the higher mind to the physical mind arrives as an inspiration or an intuition, a sudden insight, in reality, but also through dreams, when the physical mind is suppressed and the higher mind can act on a human more easily. 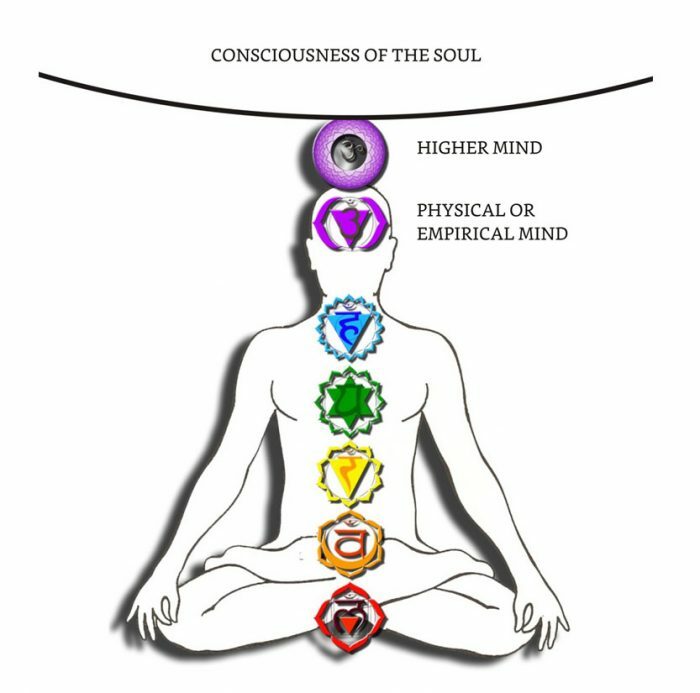 In this way, the higher mind connects our physical mind or the Ego with the consciousness of the soul. All the religious and mystical experiences of mankind reflect the connection of the physical or empirical mind with the consciousness of the soul through the higher mind. All human growth in consciousness and awareness is the growth of the presence of the consciousness of the soul in the body. Although it can not fully embody, it can increase its presence in the physical body so that the body turns into light. Even though the greater presence of the consciousness of the soul in a man is more clearly seen as kindness, love, wisdom, and enlightenment. The consciousness of the soul and the higher mind in us becomes stronger through discipline, and that is above all the discipline of meditation, but together with it, and through a positive attitude towards life, we are approaching the consciousness which is at the core of life, and it is the consciousness of our soul. There is no other consciousness in existence. It is the same everywhere, but it is simply individually used and expressed. If we accept it with a positive attitude in ourselves and express it through ourselves, then we will come closer to the same consciousness that enables everything. In this way, we will also come closer to the understanding of everything, both ourselves and the world and our soul. The greatest piece about the nature of the soul and the path towards its recognition while we are overshadowed in this world. The term atman needs to be translated as “the soul” and the Brahman as the “divine Absolute” from which the soul rises, and the text will be much more comprehensible than the “Indian philosophy”. This piece speaks about the understanding of the soul, it belongs to the ancient Slavic knowledge of the divine essence of the man, which in time turned into a Vedic knowledge thanks to the Indian variant. All about souls and reincarnation, life, and death, based on the memories from the hypnotic regression, the true stories of participants in hypnotherapist sessions. Death is here described as an awakening from the dream and the illusion of life, almost the same as the spiritual awakening is described in Advaita Vedanta and Buddhism. Although death is an awakening from the illusion of life, it is natural that the awakening doesn’t last long, and the man falls back into a dream of a new life – unless, he consciously wakes up during his lifetime, and pure, transcendental consciousness becomes his permanent character. In accordance with the Qatha-upanishad saying in which Yama, the god of death, says to Naqiketas: “If a brahman who is an atman, a man does not realize here before the decay of the body, he embodies in the created worlds … What is here (this world) is there (the other, the divine world), what is there, is here: he who sees the difference in this, he encounters death in death (becomes re-born) … there is no difference here. .. When all the knots of the heart are broken up on the earth, the mortal becomes immortal – that’s how far the learning goes ” (II-1, 4.10,11,15). “The journey of the souls” is a book that will surely change everyone’s view of the world in the best possible way because many will recognize the information contained here, from their own experience, as I have recognized them – based on their outside body experiences, encounters with their guide and the deceased. Man’s testimony of the presence of the Divine. The most complete and concise report of the soul, the nature of consciousness and life in general, given firsthand, from the highly developed soul itself, that conditionally named oneself Seth (the name has no religious or mythological connotation). The text was dictated by this highly developed soul through the media Jane Roberts back in 1971, long before modern research on the soul through hypnotic regression, and shows how much such research are correct. The book should be read slowly and carefully because the nature of the speech of the highly developed souls is extremely precise and there are no superfluous words. On page 118. one example, in addition to many others, is related to my personal experience. On page 118. Seth talks about advanced souls who help other souls during life when they enter that world (ie, “death”). When my dad was dying of bone cancer, he was lying with me in the room where we slept. He died at night, and that night I spontaneously went out to the astral scene and saw him walking accross the apartment all confused, not understanding what was happening to him. I told him that he left the body and that everything was fine, that life was going on and that he needs to be aware of himself. After that, something nice happened about the light I cannot remember, i.e. my consciousness at that moment, was not given to remember because it was not necessary at the time, but Seth explained the nature of the event very well. Like many other details as well. The root of all his speech is that the souls are conscious creators of our entire reality, both physical and metaphysical. While we are constrained in the ego and the body, we are not aware of it, but the souls are the consciousness that creates everything, all forms, from the very body it wears, as we wear clothes, to the entire reality of life. A good overview of evidence and testimonies about the existence of the soul that sciene is faced with. Saving the children from the bomb – Cokeville, Wyoming, 1986. The first study on the experiences behind this life of the people who experienced clinical death, who fully agree with the experiences from hypnotic regression by M. Newton. In addition to the human and animal world, the world of plants is an even better indicator of the action of consciousness in nature, and that everything is a part of the conscious, intelligent design. Siberian oat that plants itself in the ground (it has to hurry, it’s a short spring) is the best proof of it. Souls design all other forms of life in nature, during the period in which they are not incarnated in the body. Although Judeo-Christianity teaches that there is no reincarnation, according to church dogmatists, and some holy eyes of the early Christian church, the soul continues to learn after the death of the body. There is no reason why she would not continue to learn in the new life in this world, not just in “the other one.” There is absolutely nothing negative about reincarnation; it is a positive, logical and natural view of life and the development of consciousness through the experience of causality and purposefulness. He who does not believe in reincarnation does not believe in the soul, because, according to his logic, the soul did not exist before birth, and it can not exist after the death of the body either. It is a materialistic attitude. In the mortal body, immortal soul can not be created. If the soul existed before birth, it will exist even after the body is dying, and this is called incarnation. Moreover, there is no logical or spiritual reason why incarnation would not be repeated, like reincarnation. After all, it is obvious that one life is not sufficient for the soul to attain the divine maturity. Many people live monotonous and modest lives, and many die young. The nature and the content of the lives and the experiences of each of us show that its causality can not be limited to this one life only. The complexity and purposefulness of biological life are too great to serve only one life made up of eating, sleeping, working and death. Too much effort has been invested in the design of this world and the cosmos, for it to serve only one life that does not lead anywhere but death. If the soul was born only once, the life maturity of all people would be identical as the consequence of it. However, there is a diversity of human experiences that show a different degree of maturity of souls in different incarnations. Everything points to a wider context, to a higher perspective in which human life in the physical body is just one episode and a part of a lengthy process. If a devil wanted to seize human consciousness, he would then introduce such a belief: that there is no reincarnation. This would capture the consciousness of the soul inside of one life without perspective, and it would thus develop the fear and the mentality of the slave. Unfortunately, all the Judeo-Christian institutions are based on such mentality. The Church forbade believing in reincarnation because it is related to the principle of karma, believers would then seek the responsibility for their salvation in themselves and their actions, and thus lose the inviolable authority of the church, and this authority is given to the church by itself, claiming that salvation is only possible through her institutionalized dogma. This would also undermine the fundamental dogma of the Church that people are truly sinful, just because they are people, not because they did something bad. The dogma of the primal sin of all mankind is actually a program for controlling the mind by introducing the guilt, fear and mentality of the slave. Teachers of the original, early (pre-church) Christianity taught that the birth in the physical world is the descent of the spirit into matter, and that death in the physical body is the birth in the spiritual world – the process of rebirth (Gospel of John, 3: 3,5) the return of the man in the original state – “status quo before physical birth”. The souls, in fact, have one life, but that life consists of many incarnations, just as the earthly life consists of many days and nights, sleep and awakening. Our earthly life is the microcosmic embodiment of a much larger, macrocosmic life of the soul. The soul of a man doesn’t incarnate in its entirety, and it is so great that everything experienced by the incarnated part, the greatest tribulation and suffering in the body, is just like a dream and a small nightmare that can not harm the soul. That’s why innocent and young people get so easily killed. Many souls don’t plan to stay long in life, but just as much as they need to experience it. For the soul, it’s just like for us here when we dream that something terrible happened to us, and when we wake up it doesn’t mean anything, because we know it was just a dream. It is still told in Bhagavad Gita that the soul neither grows nor dies, that nobody kills, nor is killed. Although free from genuine suffering, the soul has a process of growth and maturation that develops successfully only in kindness, righteousness, and support towards life. The awakening of the soul is testified in this book as a resurrection or return to the Divine Source. There is no change at that time. Reincarnation, therefore, is not an impersonal reconstruction and the eternal return of the same, but a purposeful growth towards the realization in the Divine. This final accomplishment is achieved here and now, because the physical world is a sum of all the other higher worlds, the basis of their realization, and because this life is a microcosmos of all other lives. Only after the testimonies given in this book (Dr Michael Newton: Journey of Souls), that physical life is only a profound dream in which the souls deliberately and purposefully fall, while with their greater part (over 50% of their energy) remains in the transcendental Divine world, many expressions of the spiritual awakening such as the one said by Ramana Maharshi, that the liberated soul (jiva mukta) realizes that it is neither born nor dying, that for it, the life in the body is just a drama played by it as an actor; Nisargadatta that we are the Divine which we imagine from the outside; Adi Shankara about the world as a dream and illusion; Gaudapada that there is no difference between reality and sleep, and that our Self (atman) is above all conditions; Buddha; that one simply needs to wake up, nothing more. Before the birth in the body and after leaving it, our soul is in a far higher state of consciousness than now, i.e. then it is aware of itself. Here however, it is just in an oblivion. While we are in the body, we are, in fact, the most dead that we will ever be. This life is the most deadly condition which we could ever be in. The true measure of the illusion that the mind creates in this world is seen by how many people are afraid of death, and are wondering whether they will exist after it. That is why there is the doctrine of Patanjali and Buddhist meditation, which objectively and consciously establishes the meaning and the purpose of all the events of the body, the feeling and the mind. By being objectively aware of all the events we achieve them in a sense and thus become liberated (this is also the base of the ho’o ponopono principle). As much as we can become aware of them during life, we are so much more ready to die – and only as long as we are ready to die, we are as ready to live. By meditation, we ourselves do what nature would force us to, both during life and after death. That is why it is said that the awakening through meditation is the path towards the liberation from suffering. Life is simply based on the fact that we should consciously do everything we need to, so that death wouldn’t make us do it. We are essentially not born nor can die, our souls are “up” in the Divine world all the time. This life, which seems to us separated from the Divine, is just our profound dream, Matrix field in which we learn about all the possibilities of expressing and experiencing. We don’t remember ourselves so that we can fully experience it. When we fully experience it objectively, then we remember ourselves and we see that we are unborn and untouched by anything from this world, just as when we wake up from sleep and we are no longer touched by the contents that we dreamed about. This state of true vigilance and the self-consciousness of the soul is described in all the true works of the spiritual awakening, such as Bhagavad Gita and Upanishads, all those truly enlightened witness to it. When we fall into a dream in this world, we for a brief moment go into an astral world that automatically projects the contents of our unconscious world, so that we could become aware of it. When our soul falls asleep in the Divine, we immediately find ourselves in the physical world (“we are born” in the body as a man), which automatically designs the circumstances (karman) which, by their content, point to the soul the responsibility for the consciousness of itself as the Divine Spirit. Just as the mind in a dream projects its contents and we identify with them as if they were real, although they are nothing but dreams, so the soul before the incarnation projects a life that it will live in the body and it is then born, and experience that life as if it was real, though it is nothing but a dream. Just as in a dream we can wake up and have a lucid dream or a projection of the astral body, we can wake up in reality the same way, simply to see the entire existence as a dream and our immortal essence. That’s the purpose of meditation. The mind is always with some content throughout our life, except for a deep sleep without dreams. Something’s always there. Let the thought move, let passion move, some desire, some memory, some future idea, some word, something moves. All this movement is of prakrti, nature, it designs itself under the attractive action of the transcendental soul in us. All thoughts are from prakrti, not ours. We only use them and identify with them. This continues constantly throughout our life in the body. Only when you fall asleep, in deep sleep, the contents stop. The mind disappears, and you are in yourself without any content. This should be remembered because such a state will also be a state of samadhi, with only one difference: you will be aware. In deep sleep, you are unconscious, the mind goes completely into nonexistence. You are alone, you have remained alone – no thought, only your being. But you are not aware. The mind is not there to bother you, but you are not aware, awaken. Otherwise sleep can be enlightenment. Meaningless consciousness is there, but the consciousness is not actual, awake. It’s hidden – just like seed. In Samadhi, the seed has sprouted, consciousness becomes actual, awake. When consciousness is current and awake, and there is no content, that is the goal. Sleeping with consciousness is the goal. In other words: vigilance during a dream that makes up this world. This is the purpose of the incarnation of the soul. Out of birth in the body, between incarnations, the souls are in their authentic state (svarupa – see Yoga Sutra 1.3). They are born into this world of the illusion of individuality and separation in order to become awaken here for what they always are. That way, the Divine, whose souls are only emanations, becomes actual in all plans of its existence. That is why in our life the emergence of lucid dreams or out of body experiences is very important as a training on this path of awakening. In fact, the experiences of waking up in a dream appear first; as a result of a proper meditation. Being as awake in the physical world, as you are in a lucid dream, is the beginning of the great awakening of the soul. Nevertheless, they are not permanently awaken even then, although for a short period of time they see the “clear light” of their true Divine essence. The power of impressions from the physical life draws them back into further experience and new incarnations. Each soul has a series of incarnations longer or shorter before it becomes aware of itself during physical life and therefore becomes free from the need of new incarnations. This need ends with the realization of the true nature of everything or with pra-krti, that it is the ancient base, the ancient stem (universal field, the quantum hologram), the timeless sum of everything that can be at all, what it was and what it will be, everything is simply expressed through this ancient stem, which means that everything was already there, nothing new is created. Only our mind, caught up in the snake’s illusion of time, experiences this manifestation as an individual occurrence in a linear time trace. Such a mind itself causes this occurrence. That’s why we see a three-dimensional world and as if everything is happening over time. The thing is in the awakening. Only in sleep is there a time, an illusion of separation, and a process of achieving the timeless unity. We are always in it, but we dream that we are not, that we are separated physical individuals, that things appear as new and individually in our experience. From the perspective of the soul, our individual physical birth never happened, our consciousness simply entered into the illusion of time. That is why our awakening or enlightenment arises only when we wake up from the illusion of time, when we see the whole nature (prakrti) as one whole, as a simultaneous or timeless One, and ourselves, our soul as a conscious subject or witness of everything, for which all this is happening in the first place: for the purpose of the differentiation of consciousness and / or awakening. The entire existence exists for awakening only. The awakened souls who have completed their experiences with incarnation become spiritual guides of the younger souls. They are mistakenly called “guardian angels”. The souls are only conditionally able to divide into old and young, this division is not real. They are all timeless One in the Divine, and the qualities of the old, experienced ones, and young, ie. Inexperienced ones relate only to their life experiences in incarnations. “Young” are only those who have just begun their series of incarnations, and the “old” ones are those whose circle is ending. This is what the experience of the mystics who say that death during life is the only way to meet God; is based on. When the soul is released from the body, it experiences a severe disappointment due to the fact that, during the life in the body, it wasn’t able to realize its true, Divine nature. The first real awareness of oneself, which the soul experiences when leaving the body, leads it to forgiving everyone and everything that was done during life. It is also a cause of severe remorse for all acts and sins that it committed in ignorance of its true nature, while it was fascinated with the body and with the conditioned mind. After death, in the timeless moment of recapitulation, the man experiences all that he lived, but not only what he did to others, he also experiences all that others felt when he did something to them. Repentance is the reason why the soul always decides to reincarnate in the body, so it could correct its mistakes. It will do so until it develops such awareness of itself that it can have it while experiencing the worst drama of the life in the body until it attains complete independence from the body and mind while in the body and mind – until it keeps the awareness of its Divine nature, even when it’s apparently most separated from its Divine nature. Then the cycle of its incarnations will be completed and fulfilled, because then, through itself and its own consciousness, it will bring about the reality of the Divine presence in everything. That is the purpose of its incarnations. As much the soul is unconscious of itself, it is that much present in the physical world; The physical world exists because of this unconsciousness, just as the astral exists because of our attachment to the contents of dreams. Our everyday dreams show us what is happening in the great plan of the soul: as much we have been identified with the content of the dream, we are that much involved in that dream. As much the soul is aware of itself (as a transcendental Self), that much the physical world disappears for it, and only the Divine remains as itself. The physical world is tangible or materialized unconsciousness. It is needed as a basis for the projection of the image, idea, or intention of the Divine to be expressed as an individual soul. The dream of this physical world is only bigger and tougher than our little everyday dreams. Also, because of its inert nature, the physical world has the capacity to be a common factor of more souls, not just an individual area as our astral dreams. The learning of the souls can’t only be individual, but reciprocal as well. That is why they are “born” in the common world. The physical world is the collective dream of the souls. And this is the whole story behind all the allusions regarding man’s immortality, spirituality, spiritual awakening, resurrection or enlightenment. Everything else is just another dream in a dream. The whole process of life is the process of awareness. It is practically reduced to the process of letting the increased presence of the soul consciousness into this life and physical body. The enlightened people (the Buddha) and the great devotees who testified about the knowledge and the power of the soul (Jesus) are just examples of the maximum presence of soul consciousness that is possible in the physical body. About the life of the soul through incarnation according to the Sufi mysticism teaching. Little addition to the book: From the perspective of the Divine, the entire emanation of the cosmos and the individual souls and their evolution, in the form of a mineral, plant, animal and human experience, it doesn’t happen in time or in space. All this is the current act of the imagination of the Divine. All souls are One in the Divine. That is why all aspects of the experiences of soul consciousness are already present all around us and within us as mineral, plant, animal and human forms of being. All the worlds arise in an imaginary moment. At the present moment. The illusion of individual souls is that their existence takes place over time and a large number of reincarnation. This projection of time is actually a dream. It looks like that from the perspective of the human mind. From the perspective of the Divine, it is the current act, the imaginary act, which, therefore, never, ever objectively occurred. Timeless unity of the Divine is the only reality, and everything else is an illusion. Due to this, the awakening is always possible, and nothing but revival is possible or necessary. The original Buddha’s teaching, written in the pali canon, represents the purest testimony of self-consciousness of the soul in this world. It is the teaching that the body, feelings, states of mind and thought are not our permanent or essential character. Тhat is what the soul realizes after the release from the body. When the soul realizes during the life in the body, then the man is enlightened or awakened. Then, as a soul, he sees that he was not even born, nor can he die. In order to conceal this purest testimony of the true nature of the human soul, a great effort was made to distort and portray the teachings of Buddha as a “soulles religion”. This work was done by Masonic translators of Buddhist texts in Western languages. The Buddha did not speak of the soul as our lasting property, for it would thus have the opposite effect, when something like that is said to the unenlightened mind, then it exchanges the information about it with the knowledge of it, and makes a religion or a dogma from it. In Buddha’s time in India, there was a great deal of learning about the soul of man, from materialistic to animist, and it is understandable that he had to negate all those nonsense when asked about it. On the other hand, it is not necessary for the soul to convince itself that it is what it is. The Buddha was just talking about awakening and practice of revival. And nothing else. This practice takes place only by awareness, i.e. by distinguishing pure consciousness from everything that it is not. He said that there was nothing permanent in anything, and it is what physicists say today, but he did not point to nonsense, but to the true nature of existence and, indirectly, to the consciousness that recognizes it, which must be independent and objective in relation to all that it realizes. The consciousness with which a person wakes up in Buddhism is the consciousness of the soul. He spoke clearly against nothingness and against eternalism, against any kind of substance. He talked about the middle path, i.e. the path from the center, the path of purification from all attitudes and viewpoints, the path of revival. He spoke only of objective consciousness and practice for its consolidation. Such independence and objectivity in comparison to the whole existence, only the soul of а man has. It is also the only one that encourages the principle of the consciousness. A Buddhist view of the world is the view we have when we return to our original state of soul after the physical life. In addition to Buddha and Adi Shankara, the founder of the advaita vedanta, clearly speaks only of the soul and its distinction – especially in the works the Self-Knowledge (Atmabodha) and the “Jewel of Difference” (Vivekacudamani). These works are necessary for anyone who wants to know himself – his own soul. Advaita vedanta is essentially a Buddhist teaching but with a greater emphasis on the descriptions of the goal, while the Buddha’s teaching is primarily directed to practice for reaching the goal. This is an important difference that has led to these two teachings being considered different. They are distinguished only by the conditioned mind. The Advaita Vedanta is more concerned with pleasing the features of the mind to project its contents and to keep these projections for real achievements. (This problem has been explained in detail by Jiddu Krishnamurti in his work The First and Last Freedom). Buddhism does not allow it at the root. Therefore, no one can be a Buddhist, one can only be awakened and as such testify to the truth of the Buddha’s teaching. But everyone can be a vedantin as a member of the order and philosophize about the vedanta even though he is not awakened. The greatest value of the Advaita Vedanta is that it definitely and correctly identifies the soul as a consciousness of itself or the Self – atman, and that this atman is an individual expression of the Brahman (Absolute), the divine consciousness. When Adi Shankara describes an enlightened man, jivanmukta, he describes the state of consciousness of the soul that we have when we completely overcome the influences of this world, whether we are still alive in the body or not. Both Buddhism and Advaita Vedanta rely heavily on an even older study of Sankhya and Patanjali’s Yoga. Sankhya is the most expressive and most objective science of the soul on this planet. Prior to the creation of the Christian church, there were ancient schools of esoteric knowledge that have taught in detail about the soul, its nature and condition in the body, as well as the practice of liberating the soul through self-awareness (Gnosis). They were present from Egypt to India. One aspect of their learning is that there are negative forces that condition the human life in this world while in the body, they called them Archonti. They are the rulers of the world and are still ruling through their people who are especially genetically modified to serve them. This is all the former and today’s aristocracy which owns all the corporations that govern the world. In the Roman era, they ruled Rome. In order to stop the true learning of the man’s soul and its self-knowledge, they used the action of one of the great devotees of that time, who is known under the false name Jesus, and used some of his words to create the Christian church. “A Sermon on the Mount” as well as some of his non-forged words, especially in “The Gospel of Thomas” represent the greatest truth about the soul in this world. But they are also hard to understand because they are taken out of the context of a wider work on oneself. Although few, they were able to comfort, guide, remind many people, and empower them to soulfulness in this world where the soulless are the ones who rule. Everything else the Bible that we have today was forged by the rulers and turned to suit their goals: that the concrete self-knowledge of the soul is averted by the subordinate mentality of the sinner, the eternal “belief” projected in the Jewish God and the authority of the church institution. The living truth testified by Jesus as turned into a religion, which even openly tells people that they are slaves. And people accepted it. Not everyone and not immediately. All those who have not been deceived were massively murdered and persecuted as “heretics”. Some later separated themselves as the Orthodox Church and managed to preserve something from the original teachings of Christ about the soul, but this is above all thanks to the innate Slavs mentality, and not just the ecclesial learning, the spirituality that comes from the very people who in spite of everything managed to understand something about the true teaching of Jesus thanks to the true monks, the vassals. The knowledge of old schools about the soul has been partly preserved in what is known as the “esoteric Christianity”. Some of it was successfully preserved and transferred to us by G. I. Gurdjieff. Other religions do not deal with the human soul at all, revealing its true nature and purifying its presence is not their concern. The so-called “ethical religions” – Islam and Judaism – are completely focused on controlling the mind and the body, not on the liberation of the soul. In this, the control of the mind serves only to enslave the soul while in the body, while spirituality is only verbal and ritual. In essence, wherever ritualism, fanaticism and exclusivity prevail, the mentality is usually suppressed. Ethical religions, Judaism, Islam and partly Christian fundamentalism, are primarily devoted to the culture of behavior and awareness of the body. It is the lowest form of religiosity and belongs to the basic education of the people in this world. They contain in detail, everything that a man has to do every day and all his life, from dressing and eating to his way of thinking when it comes to all the general questions as well as the world, life and cosmos. Without this, immature people are lost and distracted. That is why these religions are strict in their beliefs, for their unbelievers and apostates are followed by a death penalty or expulsion from society. Therefore, it can be said that they have lifelong slaves with programmed minds, and not believers. They had to be strict because they were intended for completely unconscious and immature nations. These religions therefore had their great justification in earlier times and have it partly today as well, but with time and the merging of the collective consciousness, culture and education, they are becoming increasingly less necessary and even a factor in limiting the development of the civilization. Hence, there is a conflict of the civilizations based on the conflict of these religions that restrain life and drag it backwards with modern civilization that strives for the greater freedom and awareness of the people. Other religions are mostly animistic, which means they either don’t have a soul for the content or are degrading it to the animal nature. In such nations there is a belief that the soul after the death, goes into the world of animals and demons. One of the most common causes of conflict and misunderstanding between people is the different existential maturity of their souls. But there is another deeper problem. It rests on the very transcendental nature of the human soul. It is a divine outcome, and therefore it is instinctively aware that this world is only a dream (maya, illusion). It can enjoy it if it is beautiful, but it can never take it seriously. That’s why all soulful people are always positive, slightly childish and playful, always full of forgiveness and love, because they are essentially higher and wider than anything that is happening in this world. Completely enlightened people always become completely unrelated to the body and this world. They have fully recognized themselves as a transcendental soul and directly see the divine presence everywhere, in the very existence itself. (The best example for this is the greatest saint of the modern age Bhagavan Sri Ramana Maharshi. That’s why they have no desire to perfect this material world, to develop technology. The world is already a perfect divine creation for them. On other planets, there are human communities that know everything about the cosmos, but they don’t use technology except in minimal amount for travel. They develop and maintain only the consciousness of the soul about the divine outcome. However, the plan of the existence of this planet is slightly different. Earth is a place where young souls incarnate in order to learn the whole process of creation through work and karma, i.e. the responsibility for their actions. That is why the whole process of cosmic creation is placed in the energy centers of the human body, in the chakras, as a microcosmic replica of cosmic creation. Therefore, by its own awareness, man activates and realizes the energetic centers that represent the levels of consciousness and of being, and thus becomes aware of the objective reality through the interaction with it. The man is a link between the outside and the inner world . His being contains all the dimensions of which the universe is made. They are crossed in it, and thus come become aware of themselves. That is why a man must work in parallel, on his inner, as well as on his outer appearance, to transform the nature in accordance with his own transformation in the divine spirit. In order for a young and immature soul in this world to start “working in the sweat of its face”, in order to transform the nature through its work, coercion and enforcement are needed, because the Divine in a man is too strong and makes him somewhat inert towards the external work. That is why, mainly in the West, cultures with such coercion and enforcement have been created. In the East, the cultures that have preserved and nurtured the knowledge of the true nature of the soul have developed. Still, their balance is needed, so that the essence wouldn’t be lost. Now, their merging and permeation is happening. But without the coercion the soulful people and traditional nations tend to change things slowly or in no way; they are conservative and content with the minimum. Due to their mentality, they are happy with the existence as it is, so they could souse and enjoy it. However, the maturity of the souls in the West is not manifested merely by the recognition of one’s own divine essence as in the East, but also by the degree of transformation and understanding of the entire existence, through material culture and development. This self-perceiving transformation, which involves all nature through the work and the development of the technique, is the main reason for the incarnation of souls on this planet. This is described in gnostic texts as a process of continuing the divine creation with the help of humans. But, as we have said, souls need to be forced into this work. They are a bit lazy and innocent because of their divine outcome, which they always feel and see in everything. They must be driven out of paradise by cheating and stick and forced to “work the earth in the sweat of their face,” ie, to transform the matter. To transform it, they must learn the whole process of creation, the so-called science. The coercion and enforcement was created through Judeo-Christian religion and culture. That is why it is the leader of the creation of modern civilization and technique, while the old nations have remained in their tradition, and if they were the ones to talk, they would remain there. They would sit on the earth for centuries and discuss religion. The greatest civilizations until the 20th century were Chinese and Indian, but they did not have Judeo-Christianity (or “Judeo-masons”) and therefore welcomed the 20th century on the barrow, and they would remain in it; hadn’t the West changed the situation and initiated the materialization. Hence there is a conflict. It is most visible in the civilizational conflict of traditional values ​and the New Age, then in the conflict between Islam and the West, the Catholic and the Orthodox Church, more precisely the Slavs. The traditions firmly keep the soulful values in everything. Islam, thanks to the heritage of Sufism, holds the Divine above all, as the highest value, at least theoretically and formally while praying to God five times a day, but, on the other hand, they can’t be persuaded to put up a sewerage system or respect one single traffic sign. Slavic nations, although far more capable of creative work, stubbornly keep soulfulness as one of the only norms of all values in this world. That is why they are in conflict with the bearers of coercion and enforcement, who are trying to materialize existence, which is the Catholic Church, and the Western forces led by Zionist America. The cross, which is also a symbol of NATO, represents precisely the process of materialization and concretization, differentiation of the consciousness in the matter. This conflict is easily perceived when a Catholic despises an Orthodox for a general material lack of culture, but vice versa as well; when the Orthodox resents the Catholic or the Protestant because of soulless materialism and all the dishonest means and lies the other one uses to achieve the goal. And these are used to lying very often, because all truth is on the side of the soulful people. In order to carry out materialization, it is necessary to use lies and deceit, to work against the interests of the soul, because all the truth of this world is divine and soulful. Their entire plan is public, they openly portray it, from the Masonic hedge and hammer, their “great builder”, their name “freemasons”, their heraldic and symbols. They are the elite of the culture and industrialization of every society. All this is present everywhere around us (1 – 2 – 3 – 4 ). It is in the foundations of the Western civilization and the new age. The Illuminati use and usurp all that relates to objective knowledge and awareness – from the pyramid and the allied eye through all the symbols of astrology and cosmology – so that they would not be used and recognized. They show it all as their own heritage, hide it, and share very little information about it so that we wouldn’t recognize it as our heritage and essence. Their whole history and symbolism are filled with motives of consciousness and awakening because everything in this world revolves around it. That’s why they control it in every way. On the other hand, the very souls in their maturing in this world are enthralled with new enthusiasm by new, modern, better things, technique and culture, elite, urban civil environment, creation in every aspect, and especially in terms of life ordering and the advancement of civilization. They need only an incentive not to stand in their complacency with what has already been done. The more the soul is mature and self-conscious, it is more related to nature and simplicity, to the very existence which recognizes as Divine in everything, as the greatest master and builder who already does everything. Soulful people are always good, so the other ones must be evil, cause evil. The soul is incapable of carrying out the materialization plan. In order to experience this contradiction, it doesn’t need the help of “petty torturers”, soulless entities that are material in nature. Some of the deepest soulful characteristics and values of people manifest precisely at their hardest times, just as their worst weaknesses are shown in the worst situations. Thus, man learns all of his opposites and possibilities. And everything that is soulless and evil in this world comes from them: from the Jesuit, their masons, the Zionists and the Illuminati, the ruler families, the aristocracy, who have their own Luciferian program to force people to develop a technique and master the matter. All of them openly adore Lucifer, and Lucifer is the emanation of the divine consciousness that falls into matter. The only question is how much have they lost their balance in their evil and bloodthirst, and thus turned from this program to the madness of ruling over the people. We should not be surprised that they easily lose balance and exaggerate in the evil, because, first of all, they do not have mental maturity to know objectively enough what they are doing and, secondly, they are programmed to do what they do. Moreover, it is likely that the balance of coercion and pressure on people on one, and freedom, on the other hand, depends on both sides, and on the mental maturity of the people as well. The souls themselves are of divine origin and do not have material interests, in fact their interests are contrary to the materialization. That is why negative force and compulsion is needed; so that people with human souls on earth master the matter and all other material processes , which has recently got the name of ”science”. This process of materialization is, by its very nature, negative for people with the human soul, but it is nevertheless a divine plan to carry it out on the Earth because when people with the human soul once master the matter, then the entire divine nature (which is carried out through human souls) will be united with its contradiction, the matter. Then the Divine will be fully realized in the entire existence, in this world. Through the man. This conflict between people and non-people is now present in Ukraine. It was recently present on the Balkan peninsula. In all likelihood, it will continue to expand until most people in this world are forced to achieve the balance of the outside world with the inner substance, to take the divine plan into their own hands and to harmonize their outward existence with the inner divine presence, with their own spirituality. This is the only way the Divine can become present in this world; become the realization of the prayer: “… let your kingdom come, let your will be done on earth as in heaven …”. It comes through the man. It does not fall from the sky. Rudolf Steiner also reveals the details of the fight between the people who have a human soul and the non-people. In 1802 an alliance was established between the Jesuits and the Masonic lodges, which until then had dealt exclusively with occult knowledge. Then the role was divided, the Jesuits were guided by conceptual, spiritual and religious issues, and the Masonic organizations took over the management of politics and economy, as well as the conduct of wars. The Occult area was reduced to Rosicrucians, that is, what was left of them. That alliance was supposed to strengthen the “Arimanian demonology” and the materialism spreading across the world through “Americanism”, against human dignity that developed in the East of Europe, in the Slavic peoples. That is why the Jesuits together with the Masons decided to build America and Washington according to all occult Luciferian symbols and standards. To understand this better, one needs to look at Steiner’s book Arimanian Deception”. What Steiner did not understand is that the “impulse of Christ” in the evolution of soul consciousness in this world must pass through the process of materialization. This process is not only negative but also positive, it brings all material culture and creativity without which our life would be impossible, or very primitive, as well as the very presence of consciousness. The very presence of the soul in the matter as a magnet attracts its transubstantiation and improvement, which we see as the development of the technique and the material culture in general. The physical universe is the basis on which the potentials of all higher dimensions are realized. That is why here we need souls that include all dimensions of existence in order to attain all their potentials and aspects by their presence, to make them conscious by the realization and thereby Divine. In this way God, according to the Gnostics, through his emanations, human souls, completes his work of creation. The process of creation is completed and perfected through the man, or rather, the soul of the man. But the souls themselves have no material interests in this process of descent into matter and incarnation, which is a negative process for them, they need the help of soulless beings, Archiman or Archont, which by their nature are oriented towards the material things, just as the souls are directed towards the spiritual and the Divine, so the opposite. This, for the souls, negative process of materialization is done by the negative forces embodied in Judeo-Christianity and Masonry. Therefore, if the soulful people of the Slavic nations, were to be left as they are, science and technology would not be developed, everything would resemble Russia from the nineteenth century, when it was overwhelmed by the unilateral fanatism of folk religiousness, ancient believers, innumerable sects that hated everything that is material, and they had nothing to live on. But what is happening to the Slavs, especially the Russians, is a disorientation of the soul in the material world, and not primitivism. Disorientation is typical for the soulful people who always work spontaneously and advocate indifferently for the truth and want to help. Many good people have died in this world from their naive goodness (therefore people say: too good is (not) good). The extent and the dimensions in which we live and its laws must be understood and one must, therefore, be careful. That’s why this great bringer of the light said: “Behold, I send you like sheep among the wolves, so be wise as snakes and innocent as pigeons.” (Matthew 10: 16) It is a guide to the souls for their behavior on Earth. The snake is the symbol of the matter here, and the pigeon represents the soul. Jesus taught how to unite both wisdom. Therefore, the development of culture in the minds of people is limited only to the cessation of spontaneous behavior and the beginning of the tactical, with the understanding of the laws governing the Earth. That is why it was never necessary for soulful people to introduce the basic principles of culture and creativity; they themselves have always had it more than others, because it came out of their soul consciousness (a culture that is not inspired by the soul in general, is not a culture, but a kind of dictatorship). Hence, the relationship of one and the other, of both people and non-people, is complementary, although it seems negative and contradictory. If we were to accept that it was only a conflict of good and evil, then we would deny the omnipotence of the Divine that allows everything. If the Divine is One Unity from which everything rises and belongs to, and if it has some intentions with the consciousness of the souls in this world, then it must be assumed that it also has intentions with all other beings belonging to the same Unity. The dualism present here, has its source in the One. That’s the real war taking place in this world: a war for the soul. Everything else is collateral damage. Everything that happens in this world is the awakening of the soul. And our soul is overarching, as it is the Divine unity, which the soul arises from, as an individual emanation. That’s why this awakening game in this world is so big and fierce – due to the size of our soul.